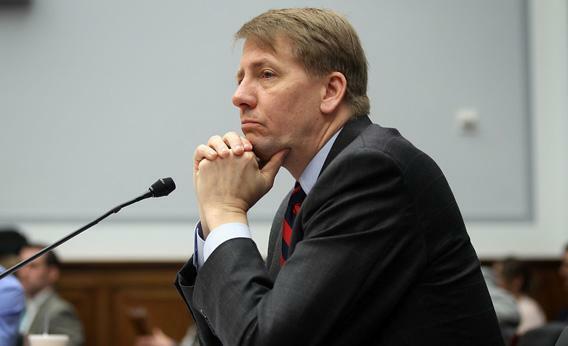 The $210 million fine against Capital One proves the value of the new CFPB. Director of the Consumer Financial Protection Bureau Richard Cordray testifies during a hearing before the House Financial Services Committee March 29, 2012 on Capitol Hill in Washington, D.C.
Capital One—famous for asking “what’s in your wallet”—will have a little less in its own wallet pretty soon. That’s because it is going to pay $210 million as a settlement for pressuring and deceiving its card holders into buying products they could not use and did not want—or what they call standard Wall Street marketing practices. My guess: Capital One wanted to know what was in our wallets so they could get their hands on it! But this is no joking mater. Credit card marketing fraud has long been a swampy mess. Added to the litany of finance-related scandals that have erupted over the past few weeks—from money laundering to mortgage fraud to LIBOR conspiracies—this latest case once again shows how much has to be done to drain the swamp. There is another equally important point here: The case against Capital One is the first one brought by the new Consumer Financial Protection Bureau, created by the Dodd-Frank bill. Remember how the financial sector railed against the creation of this bureau? We don’t need it! It’s a duplication of other agencies! But none of those other agencies have done a darn thing to protect consumers: the Office of the Comptroller of the Currency, a wasteland; the Fed, a disaster on these issues. So hats off to Richard Cordray, the former attorney general of Ohio and the first director of the agency. He has set out a bold agenda, refining the rules on mortgage marketing and issuance so consumers could actually understand what deals they were signing, and tackling the chaos of credit card marketing. This first case shows what good law enforcement can do, and should once again put the lie to the argument made by Wall Street that this agency—the brainchild of Elizabeth Warren—was unnecessary.